"Minimum water temperature in Sydney is normally about 15 degrees Celcius"
Located directly off Cronulla Beach, Osborne Shoals is one part of the reef that can be found intermittently from Kurnell to Bundeena across Bate Bay. Like Merries Reef further to the north, the top of the shoals is generally flat and covered in kelp, although some parts are covered with sponges. Once you drop off the top, however, things change. On the eastern, northern and southern sides a sharp drop off takes place with the depth going from 12 to 20 or more metres in some spots. One the western and southern sides the reef goes from 11 metres to about 18 metres or more. 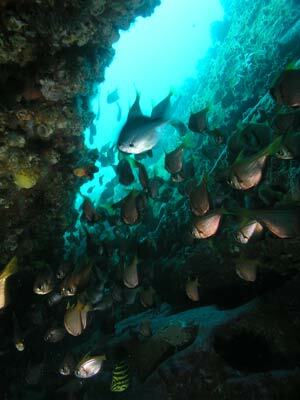 There are plenty of separate dive sites on Osborne Shoals. The normal one is called Osborne Shoals, there is Osborne Shoals East as well as Osborne Shoals South West. Another site is Osborne Shoals West. To find the reef, head out of Port Hacking towards a GPS Mark of 34° 03' 36.2"S 151° 11' 06.1"E. Note that all the GPS Readings on my Web Site are taken using AUS66 as the map datum. If you use another datum you may be about 220 metres off the wreck. See my GPS Page for more details and how to convert readings. When you get near this location, slow down and put your depth sounder on. You will see that the bottom comes up from 18 or more metres to around 11 to 12 metres. Once you are over the shallower section of the reef, do the following. In a westerly or north-westerly, run to the north-west and drop anchor once you go over the wall. In any other wind, run towards the east over the shoals a bit and drop anchor (make sure you put out a good length of anchor rope in case the anchor comes free and drops off the reef top). You should be about half way from the normal Osborne Shoals dive site and the Osborne Shoals South West dive site. It is about 130 metres from here to both in a straight line, although it is longer to the normal site when you dive (as I will explain). After descending to the anchor, if you are not already on the reef edge, swim to the west till you hit the wall. The bottom is about 15 metres. Follow the wall to the south, keeping the wall on your left. This is the most interesting area I think. All along this section there are lots of small overhangs and cracks. The reef top where you anchored has lots of small cracks about 10 metres apart that run north-south. Some of these reach the wall edge. The walls have plenty of colourful sea tulips (sea squirts) and some nice gorgonias. The depth here is about 17 to 18 metres. As you go the depth will gradually deepen about 17 metres. 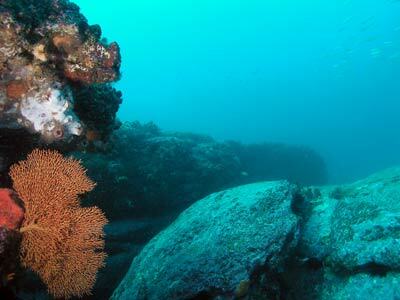 The main reef wall is about three metres at first and varies between this and two metres. After a little while the sand edge has disappeared if you are following the main wall. Do not follow the sand edge as the main wall is better. After about 12 to 15 minutes you will come to a corner. This is the anchoring spot for the Osborne Shoals South West dive site and is a good place to turn around. There are more cracks and overhangs here. All along this section there are quite a few large boulders that are located off the wall. There are also some smaller rocks further off the wall, including some on the sand. The cracks and spaces between the boulders can be home to huge numbers of ladder-finned pomfrets, yellowtail and old wives. There are also lots of luderick. Head back the way you came. Once you get to the anchor, head past this and follow the reef to the north. The wall is less prominent in spots here but it then gets bigger. There are some larger overhangs along this section and off the reef there are some small rocks. After about 10 minutes, the wall becomes more prominent. If you have dived Osborne Shoals before, you may recognise this spot as it is the western-most point that is normally reached if you follow my directions for that dive. You will see the cracks that lead back to the anchoring spot for that dive (usually covered in hundreds of ladder-finned pomfrets). Just past here the wall turns to the east and runs to the normal anchoring site. As I mentioned, it is longer than 130 metres to that spot as if you follow the wall you go in a inverse L shape path. Again, this is a good place to turn around. 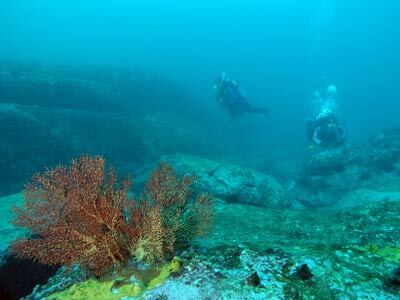 Once back at the anchor, head up onto the reef top (12 metres) and explore the small cracks and the reef generally. There are some more overhangs here that are home to seapike and ladder-finned pomfrets. This is a dive site worth diving and worth some more exploration. As far as I know, no-one divers this spot except members of the St George Scuba Club.